Depression - "coping through understanding"
Almost all of us at some time have been down about something or other. For example the loss of a pet, the break up of a relationship or unemployment. We feel lost, upset; we may cry or even get angry. We may lose our appetite or not be able to sleep. These "symptoms" seem to us to last for ever but in reality they may last from a few hours to maybe a week or so. There are lots of names or expressions used to describe these negative emotions for example "feeling down", "feeling blue", "desolate", "fed up", "hacked off". Time is the best healer here and although it may not seem like it at the time, these feelings usually pass. Often for example, starting a new relationship is the best way of getting over the pain of the old one finishing. These things are part of the up and down pattern of life.They happen to us all and we get through them. They can be unpredictable and unpleasant but they do have an end - usually - and this is when problems can occur. What doctors would call clinical depression is where these feelings go on and won't stop and the feelings are bad enough to interfere with normal life. The feelings may be so bad that you may be thinking about taking your own life to stop the feelings. If you are thinking about taking your own life then you must seek urgent help. Phone your medical practitioner immediately or even the emergency services. Click on the links here to chat to someone who will really listen and help you. I would say to you two things: First of all, if you take your own life, how do you know what lies beyond this one ? Maybe you will be snuffed out like a candle but maybe you won't. Maybe you will move into a different reality where your pain continues or even gets worse because you have deliberately stopped your Earthly existence? This is a matter of faith - or lack of faith perhaps. Secondly, by taking your own life, have you thought about the suffering and pain you will cause to those who you love and those that love you? Do you have a choice ? Yes of course you do. You ALWAYS have a choice. Depression can nearly always be cured but if you are feeling so bad that you see no future, you MUST talk to someone even if it is only a relative or a friend who cares about you. Many people struggle on with their low mood for months or even years, their depression becomes so entrenched in their lives that their whole lives are not only affected by it but ultimately governed by it. They "become" their depression and are consumed by it. By realising that they have a problem, by reaching out for answers, those with depression are taking the first step in finding answers and a way of not only coping but taking back control. Is that you ? I hope it is, in fact I know it is. So should you go and see your medical practitioner ? Well we have already seen that if you have been feeling low for a few weeks and your feelings are affecting most aspects of your life, then you are possibly clinically depressed. You can get a better understanding by reading on but in the meantime what would happen if you went to see your doctor? Would he or she decide that you were mad and lock you up in an asylum ? um....... very unlikely. Would he or she tell you to pull yourself together ? Nope ! Depression is very very common. Your doctor will have many many patients with depression. Unfortunately, depression being a problem with the brain has the stigma attached to it of being a mental illness and as a society we don't like to talk about that let alone reveal that we might be suffering with it. Things are improving however and one of the reasons for that is that depression is becoming more and more common so inevitably we are talking about it more. No-one knows why depression is increasing but it may have something to do with our stressful and hectic lifestyles. So, you may have a problem, but you are not mad or nuts you are most certainly not alone. Did you know that roughly one in five people will suffer from depression in their lifetime ? If you are female then you are twice as likely to suffer from depression than a man. Winston Churchill is a famous example of a person who had depression but he still managed to perform pretty well as Britain's prime minister during the second world war ! So your doctor will be very familiar with your problem. Today there are many different remedies or treatments for depression and your doctor will discuss these options with you in private. By seeing your doctor, you will know if the feelings you are having are caused by depression. You will feel a little better knowing what is wrong and you may have some treatment options to think about or even start. By seeing your doctor, you should feel proud that you have taken the first step in ridding yourself of these negative feelings and getting on with your life. Well I'm afraid the list of symptoms is quite a long one ! That doesn't mean of course that you have to be experiencing ALL of them or any of them in the same way or intensity. There is a great deal of variation from person to person we know that depression affects both the mind and the body so if you have symptoms from both the mind and body list you could well have depression. Depression comes in varying degrees. Some people will have many symptoms of low intensity, others may have just a few but of high intensity. We have talked about this before. This is where you may think that you feel trapped in your circumstances and that there is no hope, no relief and no future. You think that you would be better to end your life and stop the pain and suffering. What you won't realise is that these feelings are your depressed mind's interpretation of your circumstances and not necessarily reality. You must have heard the expression "nothing is as bad as it seems". This is so true when it comes to depression. Your mind cannot find a solution to your apparent problems so it decides that you might be better off ending it all. Delusions means being wrong about things. As mentioned above, during the depressed state, your mind almost creates a world which is separate from reality. You may have irrational fears, thoughts of persecution or guilt, unworthiness for example.There is often a miss-match between how you perceive yourself and how you are actually perceived by other people. The degree to which this occurs is dependant on the seriousness of the depression. This symptom can cause problems both at home and particularly at work where there is so much external stimulation. Often what happens is that you become so inward looking, so focussed on your problems that very little else is allowed a chance to register. So there is inattention, things get missed and overlooked. Work deteriorates sometimes to a point where you may not be able to carry out your role. We have already seen how your mind can be giving you the wrong impression of the world. You may be so focussed on your problems that you are blinkered to reality. If something negative happens, it can reinforce your feelings and thoughts which can lead to negative outcomes and this can start the cycle again. Examples of negative thoughts are unworthiness, guilt, failure etc. This is where normal emotional responses to various situations are suppressed or just simply absent. It's like you are disengaged from the world, like you are standing apart. You may have the feeling that you are an onlooker on life and not part of it. Some happy event like the birth of a child for example would not excite you or a special treat or present would not have much meaning for you. On the other hand if some tragedy struck, even if someone close to you were to be affected, then you would not show the same degree of concern as someone who was not depressed. This lack of emotion is in part a defence mechanism for your withdrawing mind focussed only on your own problems. On the one hand you don't need any more bad news and good news is pointless because it doesn't help you right ? Anxiety is a whole subject on it's own and it is quite possible to suffer from just this one symptom alone but then if it were just anxiety that you had then you wouldn't be depressed but you can certainly have anxiety as one of the symptoms of depression. Another word for anxiety is nervousness but it means rather more than that. It is a state in which you are hyped up or "highly strung". This state is very damaging for your body, distressing for you and anyone around you. When you mind is so obsessed and focussed on your problems, it is no surprise that you will have difficulty in getting off to sleep and/or staying asleep. Your brain is whizzing around worrying about this and that, anxiety may keep your heart racing how on Earth can you expect to sleep with all this going on ? Lack of sleep causes tiredness and lack of energy which means things don't get done, then you feel guilty that you have been so "lazy" then you might start to feel like you have failed etc, etc. So lack of sleep is a big part of depression and one of the major and common symptoms. Your wakefulness may disturb your partner which can lead lack of sleep and resentment for them, irritability for both of you and problems with your relationship if your other symptoms aren't causing them already ! Confusingly, some of you with depression may actually sleep more than normal and this is probably because of the feelings of lack of engagement and pointlessness. When faced with total sensory deprivation or in a situation of being trapped, animals will ultimately go to sleep. Another major and common symptom in depression is poor appetite. You may feel sick or bloated or have a pain or empty feeling in your stomach area which makes you feel like you don't want to eat. Are you punishing yourself in some way ? Are you not eating because you don't deserve to thrive ? Eating is one of the most basic human needs. By denying yourself food, what are you really saying ? Most people who are depressed eat very little and lose lots of weight. This is very common in depression and can be very dangerous and detrimental to overall health. Again surprisingly, sometimes people with depression can do the opposite and over-eat putting on vast amounts of weight. Is this also a self-destruct strategy ? Both over-eating and under-eating will raise cause for concern amongst those around us and in time the effects of weigh loss or gain will be very noticeable. Is this a mechanism for gaining some attention ? Well if you aren't sleeping, then you aren't going to be very awake are you? Tiredness is a natural and obvious consequence of lack of sleep. of course if you are not eating enough also then you will not be absorbing a good range of nutrients for healthy living. With poor nutrition comes lack of energy and tiredness. But tiredness or lethargy is psychological as well as physical. Your mind-set is "why should I bother ?" - maybe why should I even bother to get up in the morning ? This might explain why those of you who sleep more than normal are still tired ? Anxiety can cause "churning" tummy, trapped wind, griping, irritable bowel, diarrhoea. Poor diet, lack of food or drink can cause constipation or diarrhoea. It is quite common in both anxiety and depression to have a strange feeling in the stomach or bowel sometimes described as feeling "empty " or "hollow". Sometimes there may be an obvious reason for becoming depressed, sometimes not. There is usually more than one cause and different people have different reasons. It may seem obvious why – a relationship breakdown, bereavement or even the birth of a child – but sometimes it's not clear. Either way, it can become so bad that you need help. Often people don't realise how depressed they are, because the depression has come on gradually. They may try to struggle on and cope by keeping busy. This can make them even more stressed and exhausted. This can cause physical pains, such as constant headaches, or sleeplessness. One important factor in depression can be prescription medicines, over the counter medicines, drugs and alcohol. There are strong links between drugs and/or alcoholism and depression. It is not clear whether certain medicines can cause depression directly or whether they can unmask depression or whether the condition that is being treated is the cause of the depression. A few examples of commonly used medicines which are associated with depression are certain drugs used to control high blood pressure, steroids for asthma for example and some oral contraceptives. It is strongly recommended that whatever medication you may be taking that you do not stop taking it in order to see if it is the cause of your depression. You should speak with your physician and discuss the benefits and side effects of your medicines. By not taking your medicines, you may feel much worse. Exactly What is going on ? Ultimately, we know that a patient who is depressed has lower levels of certain brain chemicals for example serotonin which are essential for normal brain function. However, we still have no idea if the low levels of chemicals cause depression or if the depression causes the levels of the chemicals to be low. 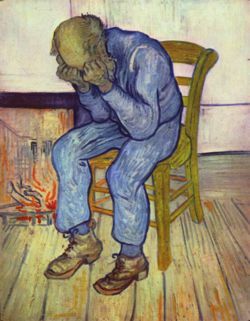 What can be done about Depression ?